As genealogists from around the country and even the world descend on Raleigh, North Carolina, today in anticipation of tomorrow’s opening session of the 2017 conference of the National Genealogical Society, The Legal Genealogist pauses for a second for a reminder. This is the conference that almost wasn’t. And it’s the conference that, for some in our community, still isn’t. Long after the contracts were signed between the venue and NGS, the North Carolina Legislature enacted a bill aimed at the LGBTQ community. HB-2, the so-called “bathroom bill,” doesn’t have anything to do with attacks on women and children by gay and transgender people: there aren’t any such attacks that anyone has ever been able to point to. And because of that prejudice, some members of our community elected not to attend, not to run the risk of finding themselves legally excluded from some of the privileges the rest of us take for granted. Our community — the genealogical community — on the other hand is one where inclusion is key. Our aim as genealogists is to find the truth about each and every member of our families throughout time and to tell their stories — whatever those stories may be. And so it is enormously fitting that the very tough topic of inclusion and many of its challenges is on the agenda at this NGS conference. Here are some sessions I particularly call to your attention if you’ll be joining us in Raleigh. 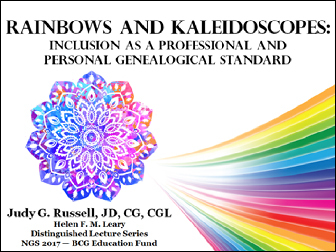 I am deeply honored to be the speaker for this session (F-307), where we will explore the profound but essential truth that we can greatly enrich our family histories, expand our client bases, and benefit from collaborations with fellow researchers when we adopt inclusion as a professional and personal genealogical standard. I hope you will join me. Later on Thursday, NGS itself turns its attention to the question of inclusion, specifically addressing the question of how to better include the African-American community in genealogical research and conferences. The session, at 5:15 PM, is the “President’s Panel on African-American Genealogists and NGS”: A panel discussion led by NGS President, Ben Spratling, about the role of African-American genealogists and NGS in developing, articulating and realizing a collective vision for a more inclusive, cohesive American genealogy community. NGS and all of the panelists, by the way (and I am one), are well aware that diversity extends beyond the concerns of the African-American community to the concerns of the growing Hispanic population, the LGBTQ community and more. It’s only that the issue is bigger than can be addressed in one hour, and a start must be made somewhere. Kudos to NGS — and to BCG — for tackling a tough topic. I hope all attendees will take the time to stretch their hearts and their minds a little bit this week in Raleigh as we all take a hard look at ourselves and our community… and how we can do better in the future. Thanks for addressing this important topic. Genealogy crosses all racial, ethnic, gender, religious and other lines … the embrace of all who share our interest in learning their family history is essential. Judy, thank you for tackling this tough subject in a public forum. I have some suggestions I would like to share at an appropriate time. Thanks for tackling this subject. The lack of comments on this blog post, I think, speak volumes that it is still a difficult subject for us “family historians”. Do we bury the family confirm bachelor along with the German Nazi Uncle. I think that family history often makes us confront the uncomfortable. And history has happened just yesterday. Let’s give all our ancestors the dignity they deserve. The subject must not be dropped, just as our society, broadly speaking, will take a long time to be healed of these ills. Thank you for your direct post. Thanks for the kind words. This is a conversation long overdue in beginning, and now up to us all to continue. Excellent talk – I hope there will be more given at future conferences. Every chapter leader at the county, state and national level needs to attend this one!